B.S. Abdur Rahman University Engineering Entrance Exam is being conducted by the B.S Abdur Rahman University. BSAUEEE is the entrance exam conducted to offer admissions in to Engineering Under graduate courses like Computer Science Automobile Engineering, Aeronautical Engineering, Architecture (B. Arch),Civil Engineering, Electronics & Communication Engineering, Electrical & Electronics Engineering, Electronics & Instrumentation Engineering, Mechanical Engineering, Information Technology, Polymer Engineering, Food Bio Technology, Bio Technology, and Cancer Bio Technology. Applicants who have applied for B.Tech at BS Abdur Rehman University must have passed 12thstandard examination with a minimum aggregate of 50% marks in Mathematics, Physics and Chemistry. For Biotechnology programmes, at least 50% aggregate is required in Mathematics / Biology, Physics and Chemistry. Candidates must had studied Mathematics as one of the subjects of study during the class 12. For admission to B.Arch. Programme of B. S Abdur Rahman University, candidates will be selected on the basis of their merit in the Qualifying Examination (10 +2 or equivalent) and score obtained in NATA (National Aptitude Test in Architecture). Candidates must had scored a minimum of 40% marks in NATA. Candidates could apply for BSAUEEE 2018 online. Online application was done separately according to exams, the candidates were going to appear in. JEE Main 2017: Candidates who had appeared in JEE Main 2018 were not needed to appear for the BSAUEEE 2018. Such candidates were required to register themselves for admission to the University and the admission procedure for such candidates will be conducted on the basis of their JEE Main 2018 rank. BSAUEE 2018: Candidates who were aspiring for BSAUEE 2018 were required to register themselves to apply for the exam by clicking on the link given below on this page. Candidates can read the complete online application procedure below. Online payment: Candidates could pay BSAUEEE 2018 Application Fee of Rs. 750 /- online through Internet banking / Credit Card / Debit Card. Demand Draft: Candidates could also pay the application fee of Rs.750/- through a demand draft drawn in favour of ‘B.S. 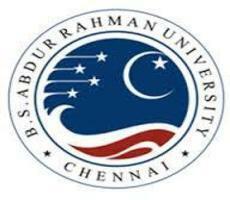 Abdur Rahman University’ payable at Chennai to the Director (Admissions). Candidates were required to mention the name of applicant and BSAUEEE 2018 Application Number on the backside of DD. The candidates appeared in BSAUEEE will be able to know their ranks and scores through the BSAUEEE Result 2019. Candidates have to enter their registration number to access or to display their result of BSAUEEE 2019. The University also accepts the JEE Main 2019 Score for admission. Candidates can check their Result of BSAUEEE in the official portal and know the actual marks they have obtained in the engineering entrance exam. B S Abdur Rahman University will conduct Counselling of BSAUEEE 2018 tentatively in the second week of May, 2018. The candidates who will qualify the BSAUEEE entrance exam will be eligible to appear in the counselling conducted by the University. BSAUEEE Counselling and admission to the undergraduate engineering courses available at the University will be done on the basis of BSAUEEE 2018. The University may conduct the Counselling for BSAUEEE 2018 and seat allotment process in one or more phases which will be decided by the conducting authority on the basis of total number of qualified candidates and the number of available or vacant seats in the engineering stream. Candidates who qualify the BSAUEEE entrance test will be called for the counselling of BSAUEEE. Qualified candidates will be called for the counselling and seat allotment will be done on the basis of the ranks and scores obtained by them. The candidates will verify their documents in BSAUEEE Counselling before taking admission to the B S Abdur Rahman University. • Other testimonials as specified in the call letter. Candidates had to choose the test centres for the entrance exam while filling the BSAUEEE 2017 Application Form.